Passengers wait at the security entrance to Concourse G at Miami International Airport in Miami, Jan. 11, 2019. Miami International Airport will close an airport terminal early over the next few days, officials said Friday, with more unpaid security officers absent from work as the partial government shutdown has dragged on. The airport said that on Saturday, Sunday and Monday it will end flights at 1 p.m. from Concourse G and relocate them to either to Concourse F or Concourse H. Miami is the 14th busiest U.S. airport, handling 20 million passengers annually. The Transportation Security Administration's (TSA) 51,000 officers will miss a paycheck Friday as the shutdown hits its 21st day. The screeners are among the lowest-paid federal employees. While they will be paid once the shutdown ends, many say they will struggle to pay bills in the meantime. A Transportation Security Administration official works at the entrance to Concourse G at Miami International Airport in Miami, Jan. 11, 2019. 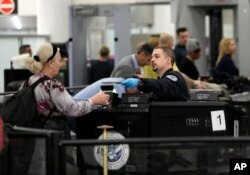 Airport spokesman Greg Chin told the Miami Herald that TSA screeners are calling in sick at twice the normal rate for Miami and managers were not confident they would have enough workers to operate all 11 checkpoints during normal hours. TSA spokesman Michael Bilello said that "in an effort to optimize resources without degrading screening and security effectiveness, where it is feasible, TSA is working with key stakeholders and industry partners to explore efforts to consolidate officers and operations." Chin told the newspaper that G is the slowest terminal at Miami Airport and 12 planes typically fly out of G after 1 p.m.
A TSA spokesman said the terminal closing early will not affect flights. United Airlines and some smaller international airlines use Concourse G.
United said in a statement that it did not expect any operational impact "as we have arranged to fully utilize alternate gates for flights originally scheduled out of Terminal G."